WASHINGTON — In an open letter to President Clinton, former British Prime Minister Margaret Thatcher, former U.S. Secretary of State George Shultz and nearly 100 other signers from across a wide political spectrum appealed Wednesday for NATO air strikes against Serb military targets in Bosnia-Herzegovina and air fields in neighboring Serbia. 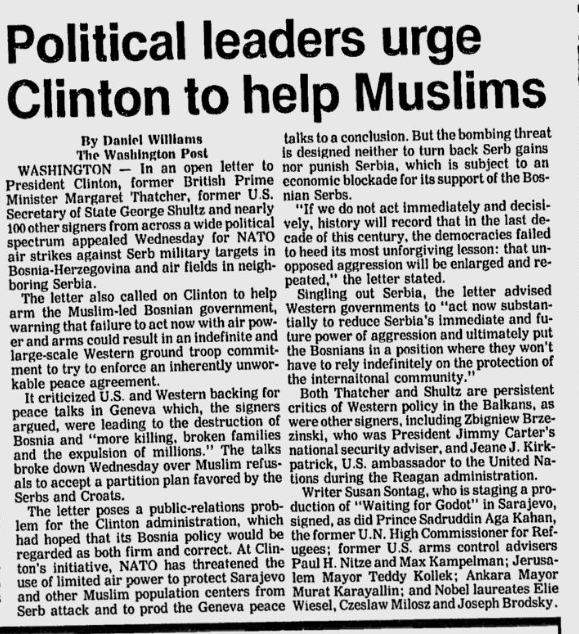 The letter also called on Clinton to help arm the Bosniak-led Bosnian government, warning that failure to act now with air power and arms could result in an indefinite and large-scale Western ground troop commitment to try to enforce an inherently unworkable peace agreement. It criticized U.S. and Western backing for peace talks in Geneva which, the signers argued, were leading to the destruction of Bosnia and “more killing, broken families and the expulsion of millions.” The talks broke down Wednesday over Bosniak refusals to accept a partition plan favored by the Serbs and Croats. The letter poses a public-relations problem for the Clinton administration, which had hoped that its Bosnia policy would be regarded as both firm and correct. At Clinton’s initiative, NATO has threatened the use of limited air power to protect Sarajevo and other Bosniak population centres from Serb attack and prod the Geneva peace talks to a conclusion. But the bombing threat is designed neither to turn back Serb gains nor punish Serbia, which is subject to an economic blockade for its support of the Bosnian Serbs. “If we do not act immediately and decisively, history will record that in the last decade of this century, the democracies failed to heed its most unforgiving lesson: that unopposed aggression will be enlarged and repeated,” the letter said. Both Thatcher and Shultz are persistent critics of Western policy in the Balkans, as were other signers, including Zbigniew Brzezinski, who was President Jimmy Carter’s national security adviser, and Jeane J. Kirkpatrick, U.S. ambassador to the United Nations during the Reagan administration. Writer Susan Sontag, who is staging a production of “Waiting for Godot” in Sarajevo, signed, as did Prince Sadruddin Aga Khan, the former U.N. High Commissioner for Refugees; former U.S. arms control advisers Paul H. Nitze and Max Kampelman; Jerusalem Mayor Teddy Kollek; Ankara Mayor Murat Karayallin; and Nobel laureates Elie Wiesel, Czeslaw Milosz and Joseph Brodsky. Credit: Reprinting courtesy of the Bosnian Genocide Blog.